Establishes a building block for Puppy Kindergarten, plus an introduction to obedience , socialization and proper manner. Providing a foundation for a lifetime, includes well behaved pups and good pet parenting with AKC’s Program. Ideal for Puppy Kindergarten graduates, and suitable for beginner dogs over 1 year old. All dogs can join thisincredibly fun class and will transform into a social creature after completing all six hikes. Different hiking locations offered each week. Janna provides a training experience like no other in Humboldt County. Her positive upbeat attitude shines through in the advice she gives to dog owners. Gentle and practical techniques are used that helps dogs become bonded to their owners. Communication and proper training are the key to a happy life with your dog. Janna has countless options for anyone, from group classes to individual home sessions where she comes to you. 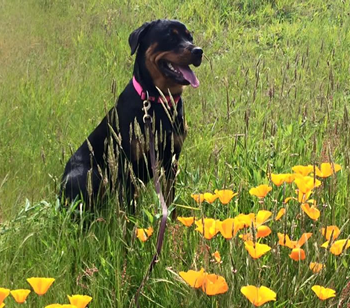 Janna has a love for the great outdoors and you will benefit by seeing some of the beauty that Humboldt has to offer in her outdoor training classes. Janna will travel anywhere to help you and your dog and she will promise practical, positive training advice that any dog will respond well to. Janna is the dog whisperer of Humboldt. She trained and socialized our American Bully pup both in private and group classes. Every dog I've seen her with is responsive to her training. We get compliments often on how friendly and well trained our dog is. Her classes teach not only obedience but also how to be a good citizen. Something Else our Clients Say! Janna knows dogs! I like to think of her as my pups therapist! She's great about responding to email questions. Her variety of classes are fun and informative for both dog and owner. Another Yummy Tidbit our Clients Say! With just a few private lessons with Janna, then class and hikes with groups have turned Cody's reactivity issues around. Janna has great ideas that incorporate real life situations to make your dog a better citizen. Janna will travel anywhere to help you and your dog and she will promise practical, positive training advice that any dog will respond well to.